Kids and Cookies - Where skiing is rewarded ... with cookies! Det Stor Koke Søke (The Great Cookie Search): Hidden out on the trails are wooden snowflakes and Viking helmets. Each one has a different paper punch attached to them. Pick up a punch card when you get your trail passes, learn the rules of the search, go out and find the required number of punches, and then trade in the card for a cookie in the Café. Pulks - These special enclosed sleds are for pulling little ones while you ski. We have them for rent and for sale. A great way to introduce your child to outdoor winter fun. Pulks can be rented by the day or half day (am or pm). On busy weekends it is recommended that you call ahead and reserve one with a credit card. 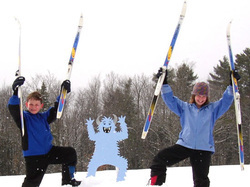 Small size boots, skis, poles, and snowshoes for even the littlest skier and snowshoer. Lessons geared especially for young skiers, to teach them the ease and thrill of gliding across snow. Kids 30-minute private lesson: $15. Our close-to-the-center wooded loops get young skiers out onto real trails, over very gentle yet fun terrain, out of any wind, and feeling like a grown-up skier. Families can bring their lunch and eat in our warming hut or on our sun deck, both are within steps of the center and overlook the meadow, or have a picnic out on our trail system. Ask our staff for their favorite picnic spots, we have tables out on the trails, some in secret places where the Trolls live. Night skiing is a unique family or group activity. Come ski down lit trails and then enjoy a special dessert and cup of cocoa - holiday weekends only. Groups can rent our clubhouse and have a ‘home base’ for the day – ideal for parties. Call us for details. Special party rates available by pre-arrangement. $50 clubhouse + $5 per child for trail pass and equipment rental. Available most afternoons. Time limits apply.